FILE - Members of South Africa's mining community walk near crosses placed at a hill where 43 miners died during clashes with police in 2012 at Lonmin's Marikana platinum mine in Rustenburg, northwest of Johannesburg, May 14, 2013. 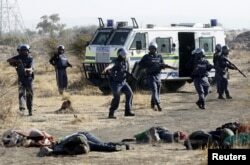 Five years after South African police shot dead 34 striking miners in the worst show of brutality since apartheid, South Africans are looking back on the Marikana Massacre and how it sparked frustration over unchanging conditions for the nation's poor. On Aug. 16, 2012, striking workers in Marikana, the site of British company Lonmin's platinum mine, gathered with sticks and machetes on a scrubby plain outside the mine to demand better pay, chanting, singing and dancing the toyi-toyi, a Southern African protest dance. And then the shooting began, shocking the nation. "Marikana was a watershed in post-apartheid South African politics and post-apartheid society," said activist Mark Heywood. "It seemed unthinkable that in the free South Africa, in a democracy, 34 striking mine workers who were not threatening anybody could be mowed down in cold blood by the police." FILE - A policeman gestures in front miners after they were shot dead outside a South African mine in Rustenburg, 100 km (62 miles) northwest of Johannesburg, Aug. 16, 2012. But five years later, activists say the poverty and inequality the miners were striking against remain. Rights watchdog Amnesty International says many of the surviving strikers still face criminal charges over their actions that day, and families of the victims are still fighting for compensation. In addition, although an inquiry was established, none of the police officers involved have faced criminal charges. In the shack settlement around Marikana, conditions have not improved, Heywood says. "All of those conditions are pretty much the same as they were five years ago," he said. "And there is a significance and a symbolism of that, because it is the story of the wider South Africa. It is the story of the way poor people are marginalized." But township-based organizer General Moyo says that some hope has sprung up around the tragedy. "The massacre itself gave confidence to many struggles across the country, even if the real achievements, or the real victory, was not actually won by the strikers, because it was silenced by the massacre, of course. But it really raised consciousness to most of the struggles that [are] taking place around South Africa, and outside South Africa," he said. 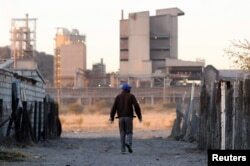 FILE - A township resident walks past Lonmin's Marikana platinum mine, June 13, 2014. He says residents of his Johannesburg informal settlement are protesting their lack of basic services. As a shack-dweller in South Africa's largest city, he says, he does not have running water or electricity. He spoke to VOA at a Johannesburg screening of a new film, Strike a Rock, about the female activists of Marikana. The film follows the path of one woman, Primrose Sonti, as she went from being a local organizer to a member of parliament for the then-emerging far-left Economic Freedom Fighters party. Sonti has spent three years in parliament delivering fiery speeches in her native Xhosa, seeking better conditions for marginalized South Africans. She has also leveraged her maternal fury in verbal attacks against President Jacob Zuma, who faces 783 corruption charges. "I am Primrose Sonti," she states, refusing to recant after calling Zuma a liar and a thief, "... Withdraw, never!" That is the mixed legacy of Marikana: pain, anger and grief, but also hope and determination that one day things will get better.